Tide Vib Score has found versatile application for both shore and off-shore fishing and we are finally answering the calls for larger size which expands the targets of this unique blade bait also to blue runners, on top of its standard commanding performance in the surf. Score 100 is yet another of DUO lures offering a progressive approach to lure fishing. The strong and wide vibrating pulsation will appeal to your targets in vast areas. Furthermore, it is equipped with an outstanding swim balance able to handle slow, fast and even super fast retrieval. Despite the wide vibrating action, you will be pleasantly surprised with how light the drag against the lure is even with the use of a high gear reel. We have a great line up of colors with a hologram installed in the inner plate of the blade. This will eliminate any chances of the hologram degrading. 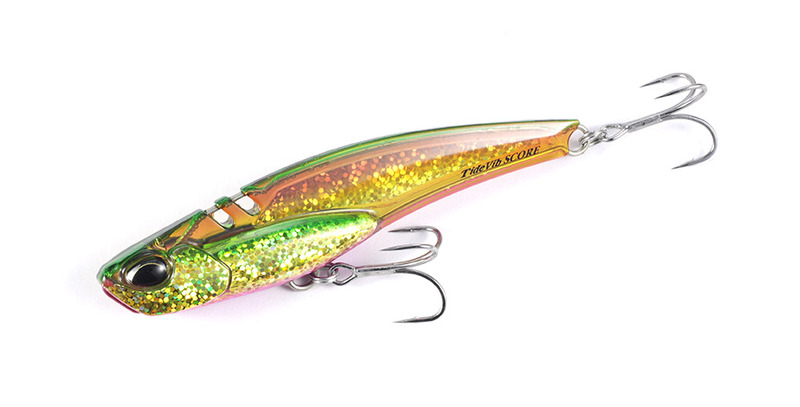 In addition, the clear resin body has enabled this lure to shine a different shed of light into our coloring scheme. We have prepared two line eye positions. The front position for your usual situations and the rear position for a more vertical game (off-shore) or when you wish for a stronger pulsation effect. We have designed a wire-through structure especially for this Tide Vib Score for more strength and flexibility in the internal structural design.